Five draws. It'd be easy to start saying that this event is boring, that we need something to spice up chess, particularly at the top level. But today it was not boring at all. The "Game Of the Day" was Carlsen-Nakamura, which has become a classic over the years, with the fan base split between the two super-GMs. Yes, it's true that Carlsen's record vs. Nakamura is overwhelming, but we all know that Hikaru can come up with inspiring ideas, especially in the opening, to stun his opponents. Against Carlsen, who can play virtually any opening, it's not an easy task, but often their games are enthralling. 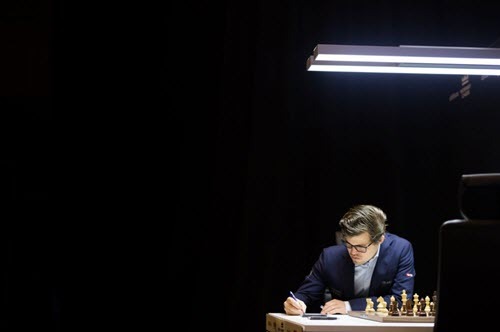 Today Magnus, in a tense endgame, found himself in an unusual - for him - fight with the clock. Two minutes - without increment - and 17 moves to reach the time control. Neither Hikaru nor Magnus had a real chance to get the upper hand in the ending, but Hikaru had 11 minutes on his clock, and that's huge if compared with Magnus's remaining time. Magnus tried to complicate a bit, going for some action with the rook, but Hikaru defended perfectly, and after a few moves which didn't change the fate of the game, they went straight into a repetition, to draw the game at move 40. With five draws, the standings didn't change: Kramnik and Nakamura lead half a point ahead of the pack, with only Giri and Anand isolated at the bottom of the list. Tomorrow is a rest day. Play will resume June the 10th, at 10 AM EDT - 16:00 Central Europe - 15:00 UK.